There’s tonnes written about workflows in Dynamics 365. All businesses have processes they follow and many of these could be built within Dynamics. This will be helpful for those in the process of delivering their first CRM implementation or are beginners with Dynamics 365. Both of these workflows can be used together, along with custom workflows, but we’ll look at them individually for now. These are on screen and help guide users through processes that may involve different records. They are built using different stages and steps that ensure you collect the correct information to help get the job done. Making the appropriate steps mandatory prevents users pushing through the stages without completing all the steps. This makes them great in a number of business scenarios from managing your sales process to keeping on top of customer cases. They offer a much better user experience which helps increase adoption and could cut the amount of time taken to train new starters. You can have a maximum of 5 entities per business process flow and 30 steps (a field within Dynamics). 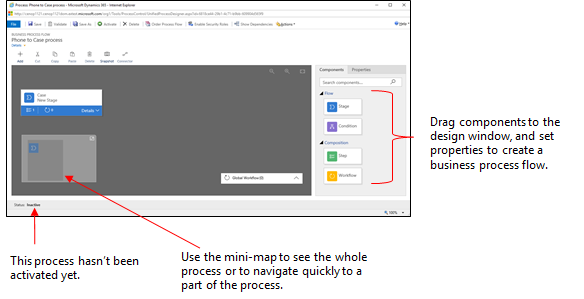 The process flow designer makes developing them much similar using its drag and drop functionality. Workflows, unlike business process flows, often work behind the scenes and can do a vaiety of things including trigger automatic communication, create/update data and generate follow up tasks. Background workflows (the most commonly used workflow) are run asynchronously and do not prevent the user from continuing. For example, I could save a new contact record and continue adding an opportunity as a workflow creates a task to notify the rest of the sales team. Real time workflows prevent users from moving forward until completion and block users from moving forward until they’ve completed. As the name suggest they, unlike background workflows, don’t support wait conditions. 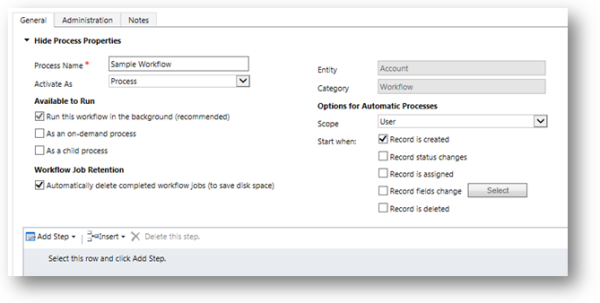 Workflows are created by creating a process within Dynamics. Each process contains a variety of steps and you can set conditions so that allows them to trigger automatically or on demand. Like the business process flow this will sit in draft status until you’re ready to activate it. Here’s a Microsoft Doc and video to provide more technical guidance. A few things to consider before you create your processes. Should this process/procedure be in Dynamics? Just because it can go in their doesn’t mean it should.